You can add, edit, and delete multiple users at once by importing a CSV file that specifies user names and information such as access privileges. When a user is successfully added, a notification will be sent to the user's main email or sub-email address on the first day of use, indicating that the account was created. By importing user information, you can overwrite existing data. No judgment is made to the content of the overwrite. If a blank space is registered in new data the old data will simply be deleted. When the changes are done, a notification mail will be sent to the relevant users and the system administrator. When a user is deleted, please be aware that the business cards, contacts, and tags held by that user will also be deleted. When deleting is complete, a notification email will be sent to the system administrator. Deleted users will not be notified. To use these functions, you must have administrator clearance. The time required for importing is approximately 10 minutes for every 100 entries. Depending on the number of users, this may take some time. When 50 or more users are added at one time, the notification of completion email sent to the system administrator will have a list of these users attached to it. 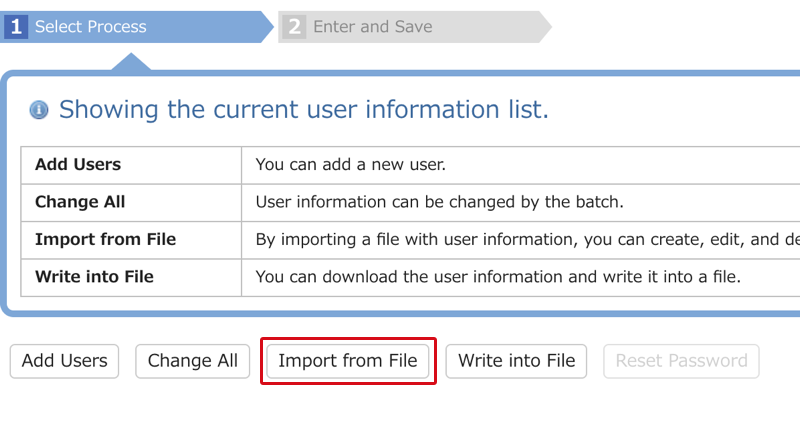 If the import file contains doubles of either user IDs or email addresses, then the import cannot be done. Delete these double entries and try importing again. If you already have more than 1000 users registered, it may take several hours for the import to finish. 1. 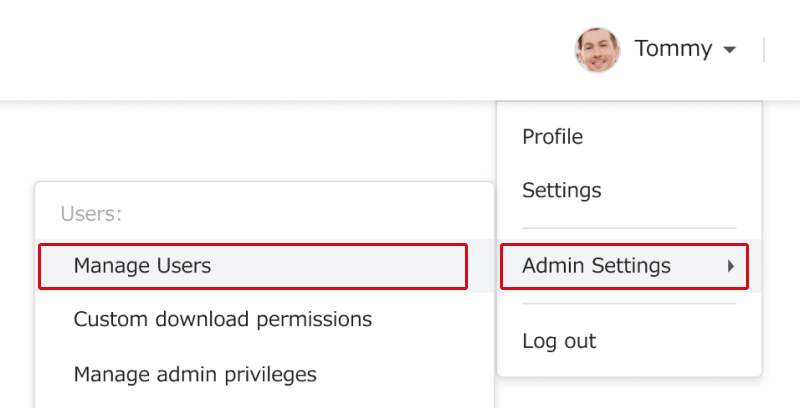 Go to "Admin Settings" at the upper right, then click on "Add/Change User". 2. Click on "Import from File". 3. Download the special format (CSV file) to be used for this. In addition to this, you can also download your current user information and use it as a basis. 4. Create the CSV file. (1) For adding users, put the users in a new line. (2) For editing users, change the information you would like to edit. (3) To delete, put a "1" in the Delete Flag for users to be deleted. 5. Choose the file you made and edited. 6. Check the contents of the file. If the first line displayed is a repetition, put a check in "Skip the top line when importing". If the character code or divider between items are different, select them from the pull down. 7. When you click on "Start Import", the import will start. 8. After the import is started, the status will become "Preparing for Import". Q. Can I add users who are working in multiple departments. A. Yes, you can. For multiple departments, separate them with a semi-colon. Q. The status "Error found" came up. What should I do? A. This means there is a mistake in the import file format or in the data entered. Please check the file again. Q. I accidentally deleted a user. Can I bring him back? A. Users deleted by reading in from a file cannot be returned to their former state. Q. The sub email address was overwritten with a blank. Can I bring it back? Q. One of my colleagues who is seconded to another company uses Sansan. Can I add him with the same email address he uses there? A. Email addresses being used under other contracts cannot be duplicated. Add the user using a different email address.